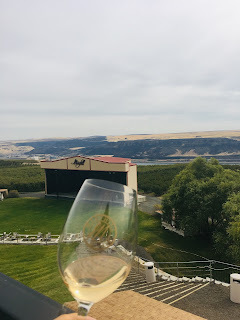 As the Wine Bloggers Conference in Walla Walla, Washington came to a close, my post-conference excursion was just beginning! We headed off to the beautiful Columbia Gorge to visit Maryhill Winery and Cathedral Ridge Winery. The Columbia Gorge, 60 miles east of Portland is part of two AVAs, the Columbia Valley AVA and the Columbia Gorge AVA. The unique climate of the Columbia River Gorge earns it the title “Mediterranean of the Northwest”. I will say that we visited in October and it was sunny and the weather was beautiful. Insert gratuitous scenery shots! Our first stop was to Maryhill Winery, which opened in 2001. The winery lies on the northern side of the Columbia River and in the southern tip of the Columbia Valley with Mt. Hood as its backdrop. Family owned by Craig and Vicki Leuthold, Maryhill is one of Washington’s largest and most visited wineries, with over 80,000 visitors annually. They also have a tasting room in Spokane. On our visit we met Kiwi winemaker Richard Batchelor who joined Maryhill in 2009. Visiting in October, there was A LOT going on. Fall is a great time to visit a winery if you want to see all the hustle and bustle up close! After 5 solid days of wine tasting for 10+ hours, by the time this post-conference excursion came up, I was in NO mood to write more tasting notes. With that being said, almost all tasting notes below came directly from the winery. Wine tasting fatigue is a real thing! Winery Tasting Notes: Vibrant aromas of melon, pear, and apricot with traces of pineapple and grapefruit, continuing into a sensational and crisp fruit finish. Winery Tasting Notes: Rich nectarine and pear notes mingled with honey. Crisp fruit flavor is delivered at the front of the palate, while a slight cream texture fills in the finish. Bri Note: A true New World Sangio but with a nod to the Old World. 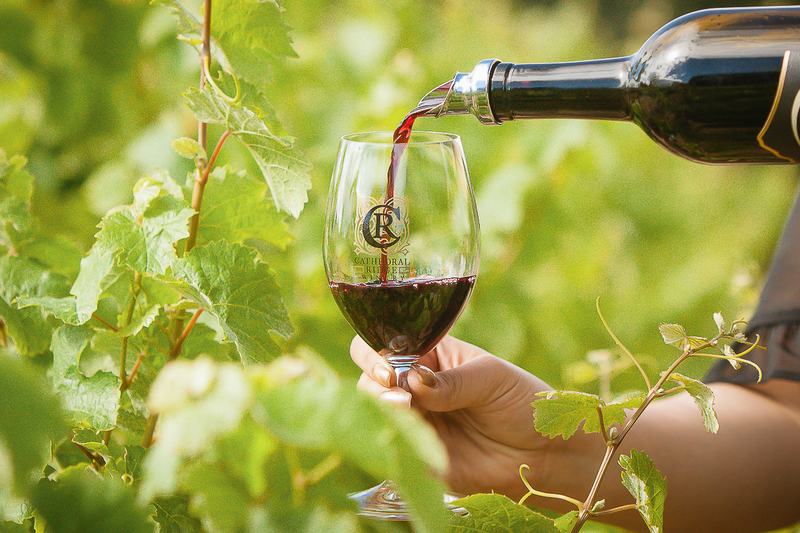 Winery Tasting Notes: Delicate red fruit notes are framed by warm cedar. The palate has a richness of fruit accompanied by mild tannins and huckleberry, allowing this wine a smooth jammy finish. Winery Tasting Notes: A sound and savory wine featuring an aroma of wood (New French) and spice and an herbaceous and lingering toasty finish with smooth tannins. This is a new release (no tasting notes online). I got spice box on the nose and jammy fruit on the palate. Winery Tasting Notes: Aromas of cherry, berry, graphite and a hint of sandalwood are met with tart cranberry on the palate. Winery Tasting Notes: Lively citrus flavors frame the palate with honey and pear, with lemongrass aromas complemented by lilac. Our next visit was to Cathedral Ridge Winery founded in 2003 by Bob Bell. Their wines are self-described as big, bold, and sensuous...and boy were they! Here are a few shots from our visit to Cathedral Ridge. Winery Tasting Notes: Delicate aromas of pink grapefruit and rose. Notes of crisp green apple, dried apricot, and honey. Winery Tasting Notes: Our Pinot Noir (60%), Zinfandel (27%), and Barbera (13%) blend. Currants and raspberry with a touch of spice. Winery Tasting Notes: Cabernet Sauvignon, Merlot, Syrah. A local favorite. Perfectly balanced, notes of deep black fruit, and cherry with a kick of pepper. Winery Tasting Notes: Earthy, dark fruit on the palate with a touch of pepper and robust tannin finish. Winery Tasting Notes: 50% Barbera 50% mystery? Bright and boisterous just like Rhett (the dog!). Fresh orchard on the nose, raspberry, and vanilla. Winery Tasting Notes: A premier Bordeaux-inspired blend bursting with Oregon blueberry pie, toffee, and vanilla.